JODIE DOESN’T LIKE GEORGE, but you’ll love the Seaside Heights Amityville Film Festival! It is the most notorious haunted house in Hollywood history, and it is to be found in an unlikely place: along the peaceful banks of the nearby Toms River, at 18 Brooks Road. To celebrate 30 years since the filming of the first Amityville movie to be filmed locally, an Amityville Film Festival is being held in Seaside Heights as part of the Free Movies on The Beach series this summer. The event is scheduled for Friday July 11th at dusk, and will show all the films shot on location in Toms River: The Amityville Horror, Amityville II: The Possession, and the mother of all horror franchise exploitation films, Amityville 3-D, The Demon. A movie poster for the film, The Amityville Horror, filmed in 1978. The cover of a video release of Amityville II: The Possession, filmed in 1981. The cover of a video release of Amityville 3-D, filmed in 1982. In 1977, a best-selling book, The Amityville Horror was published and was opted for a movie. The book was about the experience of George and Kathleen Lutz, who lived in a house at 112 Ocean Avenue in Amityville, New York for 28 days between December 1975 and January 1976. They claimed the house was haunted and was possessed by frightening and evil spirits. Adding to the macabre was the fact that the home they had purchased had previously been owned by the DeFeo family, who had all been found murdered in the house, shot in their beds in November 1974. Ronald DeFeo, Jr. , then 23, was convicted of the murders of his parents, two brothers and two sisters, claiming at his trial that he heard voices telling him to commit the horrifying crimes. The Lutzes knew of the house’s history when they purchased it, and claimed it did not bother them. On the contrary, George Lutz purchased all the DeFeo furnishings and kept them in the very same locations, including the very bed frames in which the family had been murdered. The alleged reason for the haunting or possession was accounted to a continually-disputed claim that the house had been built on a sacred Native American burial ground. Although some thought that it was an elaborate hoax, these topics were explored in a big budget Hollywood production, filmed mainly in Toms River. The DeFeo/Lutz home in Amityville, New York, as it appeared in the mid-1970’s. Because they had been refused permission to film in Amityville, the original filmmakers had to find a similar looking house near a body of water. The house in Toms River was not a perfect match. Although its location was scenic and was along the water, it was not a Dutch Colonial like the DeFeo/Lutz home. However, the magic of Hollywood created a false gambrel roofline and quarter-round windows at its peak, distinctive trademarks of the original house. Beginning in 1978, a trio of movies began to be filmed at the Toms River house, which was once located at the corner of Dock and Water Streets (now moved on the property) in Downtown Toms River, and once could be seen easily from the well-traveled roadway. Between films, the false roof and windows would be removed, only to be replaced in time for the next film. The best known features of the Toms River Amityville house, the gambrel roofline and malevolent-looking, always glowing, quarter-round windows, were a facade. The Toms River house has seen just about every movie special effect trick possible. Among other things, it has been filmed enduring a storm of hurricane strength, wind provided by large fans, and “rain” provided by the hoses of the nearby Toms River Fire Department #1. Pyrotechnics specialists have even made the house appear to “blow up” in a ball of flames, more than once, in later movies. (This proves how far the story strayed from the supposed truth when Hollywood got their hands on it. There has never been any type of fire or explosion at the original house in Amityville, still in perfect condition today.) Although all the movies were filmed in the same house, none of the plots are sequels to each other. The Amityville Horror was a Hollywood-version of the Lutzes story. Amityville II could possibly be called a prequel, as it is loosely based on the possible experiences of DeFeo family, although it is clearly fiction. Amityville 3-D is purely Hollywood exploitation. Nothing in this third film bears any resemblance to anything that ever occurred in the Amityville home. One thing is common however to all films: close-ups of the house with eerie music, focusing in on the quarter round windows near the barn roof that always appear to be glowing. 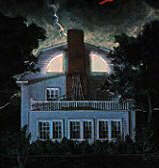 Lightning appears to strike the Toms River Amityville movie house in a scene from one of the three films. All three movies show a version of the “passageway to hell’: a bright red room in the first film, a housefly and excrement infested crawlspace in the second, and a hole in the ground in the third, said to be an old well in the film’s dialogue. None of these rooms is anything like the actual room in the house in Amityville, which was filmed in 1979 in an attempt to prove the story a hoax. The actual “red room” appears as a simple and innocent closet with a badly peeling red paint job behind a neatly trimmed-out wood paneling door. “You couldn’t even swing a cat around there.” said later owners of the house. A photo of the red room, thought to be the passageway to hell by some, and thought to be an innocent storage space by others. “There were never any ghosts, spirits or anything like that.” said a frequent visitor to the home . Other films have been made about Amityville, including a 2005 remake of the 1978 original, but none of them used the Toms River location. Sometime after the third film wrapped, the Toms River house was picked up and moved from its original location to the very rear of the property, placed parallel to the river, the opposite to how it once stood. This was an attempt to confuse curious and annoying tourists and vandals, who flocked to the house on weekends and at Halloween. Later, a much different looking house was built in its former place, further blocking view of the movie house from the street. The movie house was painted blue, and every attempt was made to distance it from the trilogy of horror flicks filmed there. Because the house was moved so drastically, it lost the ominous look and appeal it had when it had been perpendicular to the river, like the house in Amityville is. Even if filmmakers wanted to, or were even allowed to film there again, they probably wouldn’t be able to do so with this change alone. The Toms River Amityville movie house as it appears in 2008. It is clear to see that this house is NOT a Dutch Colonial, and actually has a traditional roof line and square windows atop. This is the house built on the initial site of the Toms River Amityville movie house. Although the original house in Amityville remains in the same place, it looks far different now. The quarter round windows that were its calling card have been replaced by common square windows. The house number has long been changed to 108 Ocean Avenue, and there have been other cosmetic changes to make it appear different than it did at the height of the Amityville craze. These changes were made in attempt to confuse tourists, as had been the case in Toms River. There is absolutely no mention of the DeFeo murders or the Lutzes claimed experience at the Amityville Historical Society. Locals are openly hostile to tourists who come to see the house. All of the owners of the property since 1977 have dismissed the Lutzes story as hogwash. The Dutch Colonial at 108 Ocean Avenue in Amityville, New York, as it appears in 2008. The Amityville films have had an enormous impact on American popular culture in the last 30 years. What seems to make the story so frightening is the fact that an otherwise ordinary house appears to turn on it owners. The home, a symbol of comfort and safety, becomes the unseen enemy. Unusual, but ordinary things, such as a quarter round window or a red-painted room suddenly became frightening symbols of horror and terror. The films achieved an amazing feat: forcing movie-goers to forever change how they think about their homes. Given the popularity of the movies, and the public’s continued fascination with the story 30 years on from the local filming, the Amityville films were an obvious choice to be included in the Free Movies on the Beach Series in Seaside Heights in 2008. This entry was posted on April 27, 2008 at 4:28 pm and is filed under Week of 4/27-5/3 '08. You can follow any responses to this entry through the RSS 2.0 feed. You can leave a response, or trackback from your own site. I know it’s not nearly as interesting or compelling as the reason presented, but the Amityville movie house in T.R. wasn’t moved to the other side of the lot to dissuade visitors or vandals…it was actually moved to make room for the lot subdivision and new house. 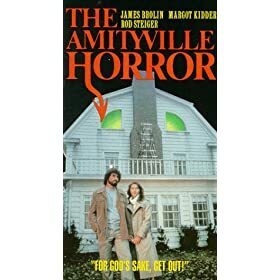 (I know this because I lived there, my parents owned it during the making of Amityville 3D, and my dad is the builder who had the house moved and then built our new home on the original spot). You’re dead right, though, about the roofline and “evil” windows–these were façades that the production company put up and took down for each of the three movies. Pretty cool to watch that happen as a kid. When the house blew up in “3D” it was actually a downsized replica build in Mexico — and they actually blew it up!.